There is a growing sense of self-belief at Old Trafford after Manchester United recorded their 5th win on the spin with a 4-0 victory over Reading in the FA Cup 3rd round on Saturday afternoon, so taking their unbeaten run in all competitions to 14 matches. Jose Mourinho rotated his squad to a degree against the Royals and has already indicated that he will bring back some of his big names for this match. Hull City started life under their own Portuguese manager, Marco Silva, with a 2-0 win over Swansea City in the FA Cup on Saturday, but their form leading into that game was far less impressive, having been winless in their previous 10 games in all competitions (although they did beat Newcastle United on penalties in the EFL Cup quarter-final in that run). Unlike his countryman, Marco Silva has no such luxury when it comes to heavy squad rotation, having inherited a squad that is both short on numbers and having to contend with a number of injury concerns. In addition, there is growing speculation as to the future of Robert Snodgrass, with the Scottish playmaker being coveted by various Premier League rivals. It’s difficult to see this being anything other than a Manchester United win, although a best price of 1/5 with Skybet (among others) isn’t the sort of odds we want to be backing. A better option is to back the home team to win to nil at 8/11 with bet365. Jose Mourinho will be looking to put this tie beyond all reasonable doubt in the 1st leg so as to be able to rest key players at the KCOM Stadium, so a fairly conclusive victory could well be on the cards. Taking Manchester United on the Asian Handicap -2 at Even money with 888sport looks a fair bet, with any win by a margin of three goals or more being a winning punt and any two-goal margin of victory resulting in you having your stake returned in full. 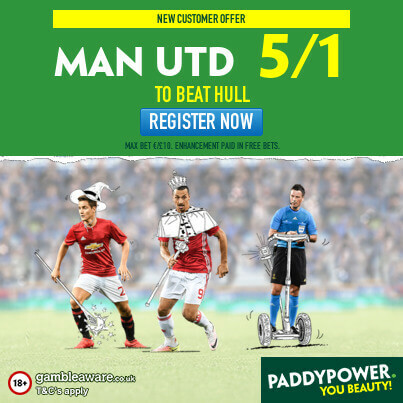 If looking for a correct score bet, a 3-0 Manchester United win at 13/2 with Paddy Power could be a runner. The Tigers might be able to keep things reasonably tight in the 1st half but, particularly if missing key defenders, they could be exposed after the break. Backing the 2nd half to be the Highest Scoring Half at 21/20 with Betway looks pretty decent value. For an Anytime Goalscorer, Juan Mata might be worth considering at 7/4 with Betfred. Manchester United have averaged 1.60 goals per game at Old Trafford in the Premier League this season, whilst Hull have mustered an average of 0.60 goals per game on their travels. Both Teams To Score (BTTS) has occurred in 70% of Manchester United’s Premier League matches at Old Trafford and in 40% of Hull’s away games. Having been rested against Reading, Antonio Valencia, Ander Herrera, Paul Pogba and Zlatan Ibrahimovic are all set to start against the Tigers. Marcos Rojo is a major doubt after going off injured against the Royals. The Tigers have doubts of varying degrees over goalkeeper Allan McGregor and defenders Michael Dawson, Curtis Davies, Harry Maguire and Brian Lenihan. Alex Bruce, Moses Odubajo, Will Keane and Greg Luer all remain long-term absentees.